After a long trip to and from tonight’s game (see the last “Not awesome” point below), I’m too tired to write a full article. So, like I’ve done in the past and as we do on the Addicted to Lacrosse podcast every week, I’ll do an “awesome / not awesome” summary instead. Awesome: The Rock in the first half. Tom Schreiber was back and looked like he never left. Dan Lintner and Reid Reinholdt continued their strong play, and the defense and transition played pretty well. Not awesome: The Rock late in the second quarter and the second half. After taking an 8-3 lead, they were outscored 11-3 by the Knighthawks. Near the end of the third, they gave up two transition goals a minute and a half apart where Paul Dawson and Brad Gillies each had full breakaways. No Rock defender within miles. Hard to blame Rose for those ones. Awesome: Best players on the Rock: Challen Rogers (again… making a bid for transition player of the year), Latrell Harris, Schreiber. Dan Taylor’s first goal as a Rock was a beauty. 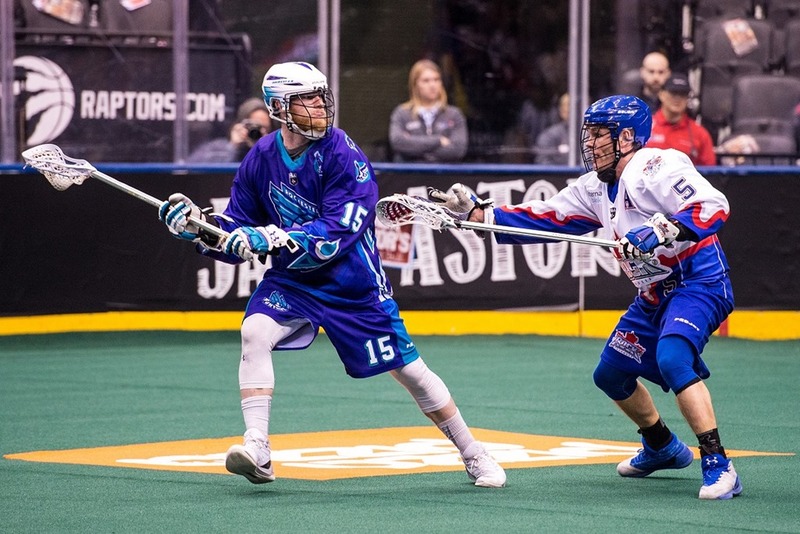 Best players on the Knighthawks: Resetarits and Jamieson make a formidable scoring duo. Jake Withers (see below for details) and Josh Currier were both solid. Luc Magnan had a nice play where he grabbed a loose ball, then fell and got back up while fighting through three Rock players. He kept the ball and ran the length of the floor. Not awesome: Toronto was 1-4 on the power play and allowed two shorthanded goals, which means Rochester scored more on Rochester penalties than Toronto did. Rochester was 2-2 on their power plays and allowed no shorties. Awesome: Nick Rose made a couple of “how did he stop that? !” saves on quickstick opportunities. Less than a minute after his second one, Matt Vinc made almost the same save. Not awesome: Rob Hellyer. Well, that’s misleading because he didn’t really play badly (he had four assists) but he had no goals for the third straight game. This is the first time in his NLL career that Hellyer has gone three straight games without scoring. He seemed to be missing the net a lot (7 shots on goal, 6 off), and a few times I thought he had decent shooting chances but he chose to pass instead. The Rock did a lot of that in the second half, actually. Instead of three or four passes and a shot, it was five or six passes and then a missed pass or shot. Awesome: The Knighthawks D. They limited the Rock to lots of outside or bad angle shots and shut down a number of crease dives before the player got to the crease. Not awesome: Matt Vinc before he was pulled. He gave up 7 goals in about 22 minutes before he was pulled for Angus Goodleaf. Goodleaf faced one shot in 36 seconds and didn’t save it. Vinc came back in then (leaving Goodleaf with a GAA for this game of an even 100.0) and was excellent the rest of the way. Awesome: Nick Rose launched a pass halfway down the floor above the head of the 6’4″ Challen Rogers. The 5’9″ Cody Jamieson, standing right next to Rogers, jumped and intercepted it. Nicely done, Cody. Not awesome: Rock fans who booed the refs for not calling a penalty on Eric Fannell after a cross-check to the back of Sheldon Burns’s head. Burns didn’t have the ball, so there was no particular reason for the refs to be watching him. I didn’t see the hit until the replay, and given that the hit was so blatant on the replay, it’s obvious that none of the refs saw it either. Did it deserve a penalty? Definitely but they can’t call what they didn’t see. Actually it seemed that both teams were angry at the refs in this game. I’m not sure if that means the refs did a good job or a bad job, but I guess it means they were unbiased. Awesome: Tom Schreiber given a penalty shot! Not Awesome: He didn’t score. Awesome: Jake Withers at the dot. Withers won 22 of 28 face-offs, or 78.6%. He’s played 16 games this year and has only been below 60% in three of them and only below 50% once. That’s pretty close to Geoff Snider territory and for a face-off guy, there’s no bigger compliment. I’m not sure why Brad Kri wasn’t facing off against him most of the night (he was 3/4) but Magnuson was 5/23 and Chapman was 0/3. And Withers is no FOGO either – he played some pretty solid defence as well. Not awesome: Tom Schreiber dove through the crease and Matt Vinc crosschecked him in the head. Somehow it was only a two minute penalty. The Knighthawks tweeted “Schreiber crashes the net and Vno jumps out to cut off the angle”. Riiiiight, he jumped out with his stick out in front of him horizontally, which is generally how goalies cut off angles. Awesome: After that Vinc hit on Schreiber, Adam Jones, who has two major penalties in his career, neither for fighting, was in Paul Dawson’s face though I didn’t see why. “In Paul Dawson’s face” is quite figurative – the top of Jones’s helmet was at Dawson’s chin. They didn’t fight or even push each other but kudos to Jones for being physical and aggressive with the massive Dawson. Not awesome: Brett Hickey was a healthy scratch. Hickey has been struggling all season: one goal in his last three games, one game with more than two goals (he’s a former 50-goal scorer, remember), and seven games with zero assists. Oddly, he’s almost on pace (2.4 points per game) for the same output as his 2016 season (2.8 points per game). His 2015 and 2017 seasons were both around 4.5 points per game. Maybe he just likes odd-numbered years. Anyway, we’ve seen cases where big-name players who are struggling are “given a game off” and come back with a vengeance so let’s hope Hickey’s fire is re-lit. Not awesome: Injuries, on both teams. Sheldon Burns twice left the floor and headed straight for the dressing room, one time holding his arm very still as if his shoulder was injured or dislocated or something. I saw both Brodie Merrill and Kieran McArdle limping off the floor. A Knighthawks player was down for a while until the trainer helped him off, and I remember seeing a few other players making their way to the benches seemingly in great pain. These things happen every game but it seemed like more than usual. Not awesome: My travel to and from the game. The 403 through Burlington and Oakville was so packed that Google told me it was faster to go 407 / 403 / 401 / 427 / Gardiner rather than just QEW from Burlington. Once we did that, I decided to hop on the GO train from Mimico to avoid downtown traffic. We bought tickets as the train was arriving and ran for it but the doors closed less than five seconds before we got there. We waited for them to re-open the doors but no such luck and the train pulled away without us. We managed to get a refund on our tickets but then had to hit the highway again. Made it to the parking lot and finally to the ACC. Missed the first 15 seconds of the game. Then there was an accident on the Gardiner on the way home which delayed us by half an hour. We would have missed that if we had made the train. This entry was posted in Game Review, Rochester Knighthawks, Toronto Rock. Bookmark the permalink.